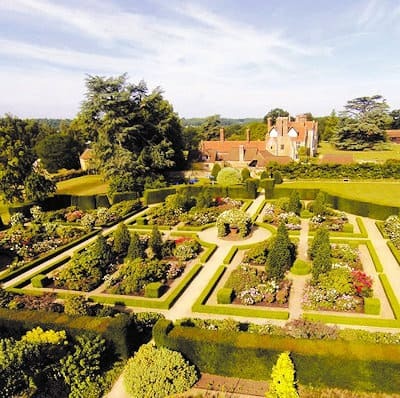 Part of the magnificent grounds of Loseley Park, the original two and a half acre Walled Garden is largely based on a design by Gertrude Jekyll. The Walled Garden features five exquisite gardens, each with its own theme and character. The award-winning Rose Garden is planted with over one thousand bushes, mainly old-fashioned varieties. The extensive Herb Garden contains four separate sections devoted to culinary, medicinal, household and ornamental. The Fruit and Flower Garden is designed to provide interest and bold, fiery colour throughout the season. The White Garden, in total contrast, is planted with white, cream and silver plants, with two water features, creating an idyllic and tranquil area. The Organic Vegetable Garden is spectactular with a huge variety and the Wild Flower meadow is an attractive display during the summer months. Other features include the magnificent vine walk, mulberry tree, ancient wisteria and moat which runs almost the entire length of the Walled Garden and is abundant with wildlife and aquatic plants including water lilies. Groups Rates: Minimum group size: 10. House and Gardens : Adult £9.50, Child £5.00. Facilities: Tea Room marquee for light lunch and tea. Pre-booked catering for Groups. Gift shop and Plant Sales. Disabled Access: Yes. Toilet and parking for disabled on site. Wheelchair on loan. Ground floor of house only accessible to non-motorized wheelchairs. Tours/Events: House tours and garden tours for Groups by arrangement. Location: 3 miles south of Guildford via A3 and B3000.